Avoid feeding pets outdoors (if you must feed pets outside, feed during the daytime and remove the uneaten food as soon as the animal has finished). Feeding wildlife and feral cats can attract coyotes. In addition to coyotes eating the food, mice and other animals will be drawn to leftovers, which can subsequently attract predators such as foxes and coyotes. To discourage coyotes from associating people with safety and food, eliminate the food sources around your yard and engage in hazing if you see a coyote on your property. Hazing is a process used to reinforce a coyote’s natural wariness without harming them. To haze, be big and loud: Wave your arms, shout, use noisemakers, throw non-edible objects in its direction (but not at it), or spray the animal with a hose. It shouldn’t take much for the coyote to get the memo -- just be persistent and maintain eye contact. Do not haze if a coyote is sick, injured, with pups, or is in its territory or out at night. Keep small pets inside when possible and monitor them while outside. While walking dogs, use a secure, 4-6 foot leash and do not let dogs explore vegetation that you can’t see through. It is advised that pets be fed indoors. If pets must be fed outdoors, feed during the daytime and remove food as soon as your pet is finished. For more information on hazing and pet safety, visit: http://www.austintexas.gov/department/coyotes-central-texas. 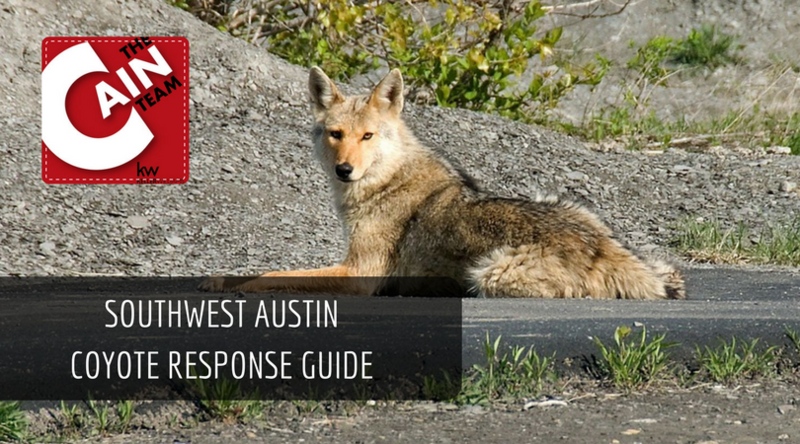 For immediate assistance, or to report a coyote that is sick or injured, call 311. Article courtesy of City of Austin’s Animal Services.